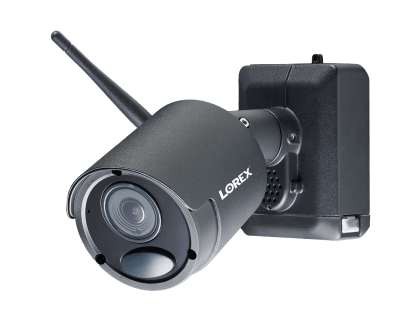 Learn more about the Lorex Black Metal Wire-free Accessory Camera with 4-IP Cameras. Find pricing, and answers to common questions. The Lorex Black Metal Wire-free Accessory Camera can be paired with an LHB926 or LHWF1000 DVR to expand the total number of cameras in a business's wire-free security system. This Lorex security camera provides clear audio. 140 ° ultra-wide field of view. Pros: Wire-free. Easy to install. 140 ° field of view. Audio-enabled. Two-way talk functionality. Cons: Easy to remove if not placed in a hard-to-reach location. Bottomline: Hassle-free, feature-rich accessory to add to your business's wire-free security system. What are some alternatives to the Lorex Black Metal Wire-free Accessory Camera? Where can I buy the Lorex Black Metal Wire-free Accessory Camera? The Lorex Black Metal Wire-free Accessory Camera is available via Amazon and the Lorex website. Does the Lorex Black Metal Wire-free Accessory Camera work at night? Yes, despite this camera being called diurnal. It comes with infrared LED lights to ensure footage that is captured at night is crisp and clear. Its night vision range is up to 150 ft. in ambient lighting, and up to 100 ft. in total darkness. Can the Lorex Black Metal Wire-free Accessory Camera be used in any weather? Yes. The Lorex Black Metal Wire-free Accessory Camera is weatherproof. It is resistant to inclement weather, and can operate in temperatures ranging from -4 °F to 113 °F.